Are Scots really tighter than their southern neighbours? The myth of the 'canny Scot' is an enduring one, and one that is received rather well North of the border. But where did it come from? And is there any truth in it? 'Scotch jokes' appeared in popular British magazines like Punch from the 1800s, and they quickly stuck. But the origins of the myth are shrouded in mystery, and spread surprisingly widely. A post by The National Trust for Scotland Foundation USA suggests rather ironically that it comes from Victorian Scots splashing their cash in the Wild West. Scots invested fortunes in American cattle raising, railroads and mining, giving the investors reputations for being tight with their money at home, and being canny business owners in the US. Some say the origins are even older. A Daily Mail article dating back to 2004 suggests that the stereotype has origins in the 16th Century, when large numbers of Scots emigrated to Poland, and the Scottish merchants were such tough negotiators that the Polish saying 'Skapy jak Szhot' (as mean as a Scot) emerged. Decipher that, and you'll see plenty in support of a culture that prizes thrift, economy and saving money. Perhaps this needs to be settled the old-fashioned way: with statistics. Fortunately, The Office for National Statistics has broken down their 2013 household spending survey by region. According to the survey, average household expenditure in England was £696.70 per week. North of the border, this dips to £604.90. Although the average English household had more people in it, with 2.4 residents compared to 2.2 in Scotland, the per person spend is still £290.29 against £270.95. So the Scots do seem more canny with their money. Of course, it's only fair to give the Yorkshireman his dues. Yorkshire and the Humber was the thriftiest of the English counties, spending just £558 per week, or £242.61 per person, trumping even Scotland's spend. In fact, there's more difference between Yorkshire and Scotland than there is between Scotland and England. But before you jump to conclusions, there is a final twist in the tale. One region has emerged from the shadows of mythology to out-frugal their neighbours by an impressive sum. With an average household expenditure of £539.40 (£234.52 pp), Wales is by far the lowest spending of the Home Nations. Wales, we salute your money saving skills. While these general trends are interesting, it's important to note that the spread of jobs, cost of living and house prices vary hugely by region, and affect the statistics (and attitudes) of people living there. 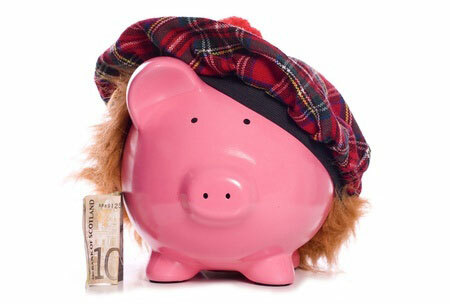 The only surefire way to be canny with your money is to save, and invest, wisely. Start by using Money Dashboard's free finance software to monitor your expenses, and soon you might be competing for the title of most canny Brit.